Today I am sharing two of my new favorite things...the first being American Crafts Shoreline collection (used on both layouts) and Gesso/Modeling Paste. 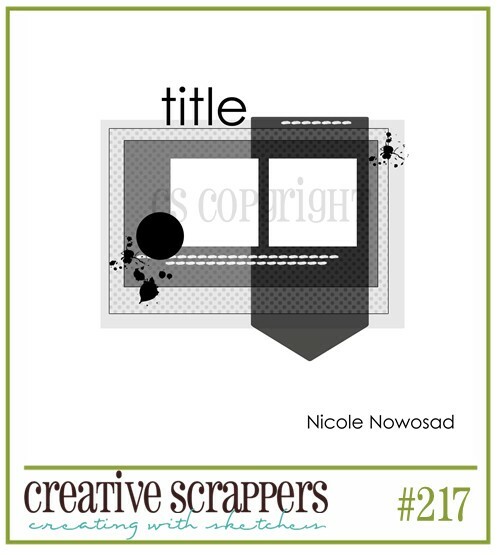 The first layout up, is for the new Fabulous Friday challenge at Frosted Designs. We are challenging you to use FABRIC this week on your layouts or projects! Aren't those the most fabulous papers??!! I don't know how AC does it, but everything they put out is awesome!! I couldn't wait to use these papers and they did not disappoint. I was a little sneaky with my Fabric on this one. It is the Yellow matting behind my photo, the little flowers with the pearl centers, and the Yellow flag. I used some squares of fabric and painted over it with Mod Podge, to make it a little more stiff. Once it dried, I just cut the Yellow square to fit as the mat behind my photo. I fussy cut the little flowers from a different square of fabric and added the pearl centers for texture. And I used a little left over piece of the Yellow fabric to make the cute little toothpick flag. The sketch is from Creative Scrappers and I didn't get a chance to use this one when it was first posted. I really loved it though so I saved it and thought it worked well with these photos. This second layout is my newest favorite!! :) I played with Modeling Paste on this one, which is something I've never done before. It was SO MUCH FUN!! Kim Watson shares a tutorial with this technique HERE on the Creating Keepsakes page (and just a heads up: I was not able to get the video to play using Internet Explorer. I had to use Firefox. So if you only have IE, you may need to download Chrome or Firefox to view the video). I love the awesome texture that this technique adds to your page! I used a SC Hexagon mask and then applied the paste over the mask, making some high and low spots along the way. Once the paste dried, which didn't take long, I sprayed over it with a little bit of Smooch Spritz. Then I used a baby wipe, like Kim did in the video, to blend the mist. I am raring to do another page with this technique, because the results are so great! And of course, I used the Shoreline papers for this layout also. The colors are so pretty and I love the way they all coordinate together. Plus there are some great fussy cutting elements on these papers!! the layout and the design is nice,,,, looks great!! Ashley! These are both amazing layouts! These colors are such a perfect blend with your style! Wowwwwwwwwwww!! These are both beautiful!! I loveeeeeeeeeee the bright, happy colors!!! Ashley, you are so creative and ever so talented. Love these layouts! these are great, love how colorful they are and yes I agree, shoreline is sooo cute, can't wait to get my hands on it, love your misting! Ashley I love how your sense of humour and fun is expressed in your LOs. wow! these are TOTALLY GREAT! That shoreline is a new favorite of mine! Love your first page! The fabric looks fabulous!!! You really paid so much attention to detail and it shows! And your second page is amazing! Love the colors and how they blend together perfectly! You have such an eye for things like this! I think the technique you used with the modeling paste really sets this page high on the bar of awesomeness! Love your work! Thanks for sharing your new pages! Amazing pages Ashley!! I love how the gesso turned out. Wow! Both pages are amazing!! I love the way you used the Mod Podge to make the fabric stiff and easy to cut! I am going to have to remember that trick!! Thanks for the tip!! And your use of molding paste in the second LO is gorgeous!! I can't wait to get my new studio up and going so I can get messy and play!! BOth of these layouts are awesome! I love the technique you used for the fabric and how you used it as the mat for your photo! And love what you did with the molding paste and mask! I have to give this a try!!! what sunny and bright layouts - they're so gorgeous!